Somehow I tried to believe that I, too, was now “off.” I have to admit: I’ve been a little casual about cleaning and a little last-minute lazy in the kitchen. But aren’t I allowed? I always try to keep it simple, even more so now. Throw something on the grill (or let my husband). Turn the oven on minimally. Enjoy the fresh produce in simple salads. Eat what is in season. One such food now in season is Copper River King Salmon. Known for its abundance of Omega 3s and anti-inflammatory properties, Wild Salmon is considered one if the world’s “Superfoods.” Although I have to admit, it isn’t my favorite thing to eat, I do so a few times a month for health reasons. I have found a few ways to prepare it that, I think, tempers, without masking, the flavor. And a crisp glass of white only enhances the meal. At the local HEB, they were sampling a New Zealand Sauvignon Blanc, Drylands, that I liked quite a bit. Based on that, she suggested I try Sea Pearl, on sale at $9. Sold. Subtle grassy notes, tropical fruit and lime zest. Very easy to drink with fun acidity. For this dish, I mixed chili powder, smoked paprika, salt, cumin, thyme, and s little garlic powder and dusted the fish. My favorite grillmaster got it super hot and seared it for a minute, then turned it down to 400 for about ten minutes (depends on size of filet). This gave the fish a really nice crust. While it was cooking, I made a lime-cilantro butter which I drizzled over the fish when it was done. 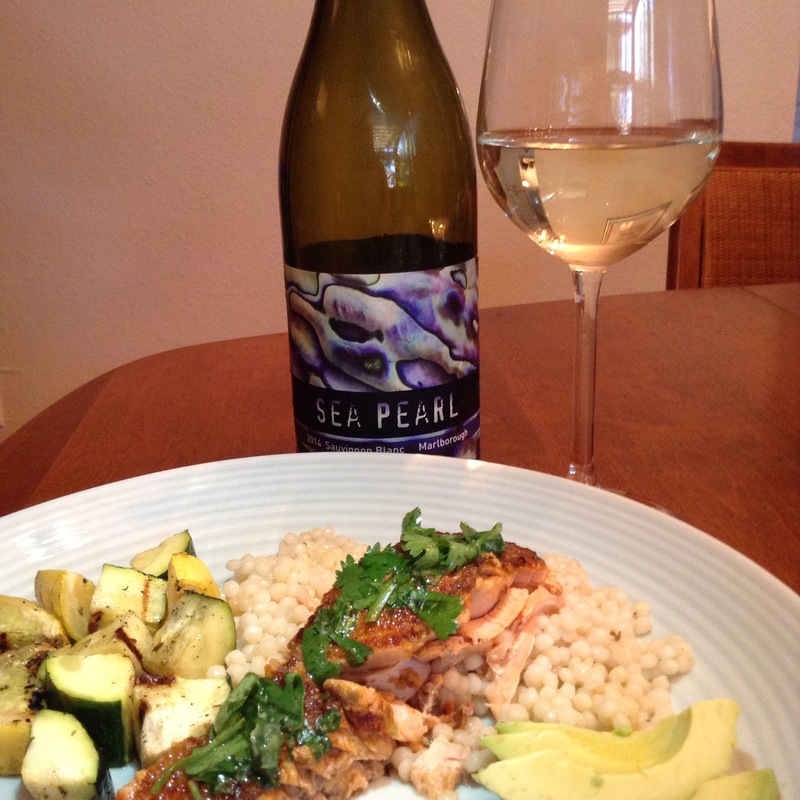 Add some grilled zucchini, Israeli couscous (for those eating carbs), an avocado and you’re done. It paired really nicely and was a fun change from my norm. But seriously, Domaine Sigalas in making wine from some of the oldest vines of Santorini. The vines are not trellised, but grown in these beautiful cylindrical baskets of vine. 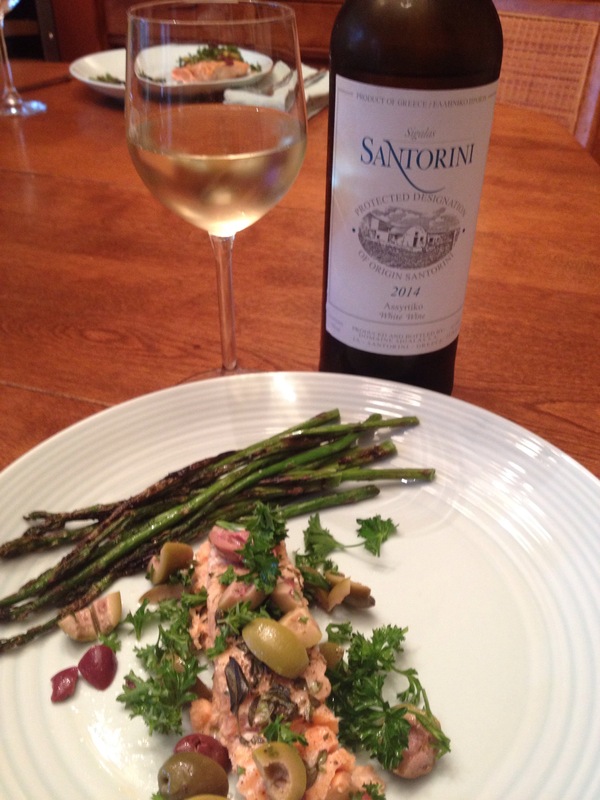 The Assyrtiko was packed with minerality and vibrant acidity. Balanced, playful, citrus and stone fruit; I enjoyed every drop. An image formerly on the winery’s website. Salmon can be tough sometimes. The intensity of flavor doesn’t always “play well.” I’ve done Soy glaze, tropical salsa, dill yogurt, and a few others. These, so far, are my favorites. Easy, quick, tasty, and I usually have the ingredients in-house. And since we have another month of Salmon season, I’m sure I’ll be finding more. I’d love to hear from you (if you aren’t out frolicking). What are your favorite preparations and pairings? And what are your go-to, not-much-time-in-the-kitchen meals? I’ll be sharing more here and also meals that can be made at the campsite. Happy summer! I picked up the Assyrtiko too. Loved it! I can certainly taste it with your salmon. I bet the NZ Sauv Blanc was delicious too. Great pairings. Cheers. I just hope they continue to carry it! Thanks for reading. I’ll check I out. Thanks!